Maria Stepanova was born in Moscow in 1972. She graduated from Moscow Literary Institute (1995). Her works have been published in numerous magazines including “Zerkalo,” “Znamya,” “Kriticheskaya massa,” “Novoe Literaturnoe Obozreniye,” etc. Stepanova is the author of twelve poetry collections and two books of essays. 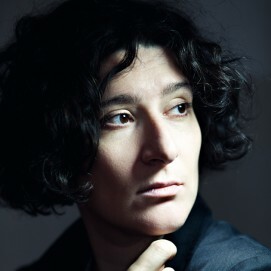 She won the “Znamya” magazine prize in 1993, the Pasternak Prize in 2005, the Andrey Bely Prize in 2005, the Hubert Burda Fund Prize (Germany) for new eastern European literature in 2006, the Big Moscow Score Prize in 2009, Lerici Pea Mosca prize in 2011, and Anthology prize in 2012. Her poems have been translated into English, Hebrew, Italian, German, Finnish, French and other languages. In 2007 Maria Stepanova founded the independent online journal OpenSpace.ru, Russia's main daily online edition covering cultural issues. Later she reconfigured it as the crowd-sourced journal COLTA.RU. The poetics of Maria Stepanova, at once contemporary and timeless, disproves the notion that there is a crisis of in traditional prosody. Stepanova experiments with the authenticity of the author's utterance, applying the author's idiosyncrasies to a poetic persona. It’s not only a figure of speech for her, but an act of a personal will, an attempt to break through to the subject. Stepanova’s poetic language is very distinctive: word forms pass through deformation on every level, bringing new senses, both actual and potential, to light.